The asphodel, one of the family of the liliaceae, is flowering in the springtime. The plant was once regarded as very protective. People used them to make crosses in order to protect and favour harvest and with the dry leaves they filled mattresses. Dry leaves that are still eaten in summer by the animals. The asphodel holds an honoured place in Corsican tradition.Its name alone speaks for its antiquity. Asphodelus, its name in Greek, is considered to be a word of pre-Indo-European origin; linguists say the same of its Corsican names: taravellu or taravucciu. More explicit are the popular names it goes by in the island: fiori di morti - "flower of the dead" - and candellu or luminellu, meaning a large or small candle. The official name of the variety found in Corsica is in fact Asphodelus ramosus. Surabundant, the asphodels cover the Corsican landscape in spring. Growing on barren, sandy and rocky soil where no other plant can survive, they light acres and acres of land with their little pinkish star-shaped flowers sprouting from their stiff branches, like gawky candelabra. The bulbs, when heated, explode like fireworks, to the joy of the children who on the feast day of Saint John the Baptist hold them in the fire built in the village square and then knock them against stones to make them bang. Today they appear to many people simply as an ubiquitous and rather ungraceful wild flower. But the asphodel bears a noble heritage which has been progressively discredited. The Greeks believed that it grew densely in the Elysian fields, resting place of heroes, and it was a food agreable to heroes and the gods. For centuries it was planted near tombs to nourish the dead. It also fed the living. The asphodel is edible: the substance of its bulb can be made into a kind of bread. But this food lost its importance with the advance of agriculture. Once valued as a plant to nourish animals and men, it was relegated to the status of a wild flower after the introduction of the potatoe. This occurred in Corsica not before the eighteenth century; Paoli, who actively encouraged it, was nick-named "Generale patata". After this the asphodel became known, rather scornfully, as "the bread of the poor". The plant however, continued to be esteemed for its medicinal properties. Concoctions made from its bulb and stem were used with more or less succes to treat a large variety of ailments: indigestion, coughs, inflammations, ulcers, toothache, as well as the letal disease that plagued Corsica until recent times: consumption, that is tuberculosis. To be used in such circumstances, it must indeed have been considered magical. 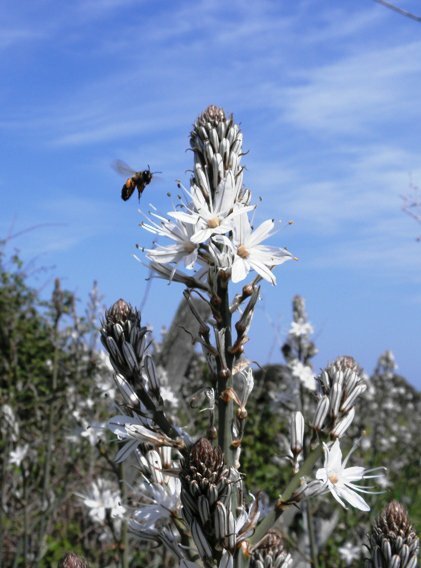 Sacred, restorative, beloved of the dead, the asphodel became a symbol of Corsica as a whole. "He has forgotten the asphodel" was a popular saying meaning that a man had forgotten everything about his native land, had denied it. The choice of the asphodel as a weapon in the mazzeri's1 battle can be accounted for by the plant's two-fold association with death. On the one hand, it possessed a force that resisted death, by counteracting maladies and flourishing on almost sterile soil; on the other, it nourished and honoured the dead, lifting them to the ranks of gods and heroes. Today it is no longer seen near tombs, unless it has grown there by accident. 1 mazzeri are dream-hunters, who go out at night to kill an animal. They recognize in the face of the animal someone known to him, nearly always an inhabitant of his village. The next day he will tell what he has seen and the person mentioned will die in the space of time running from three days to a year, and always within an uneven number of days.